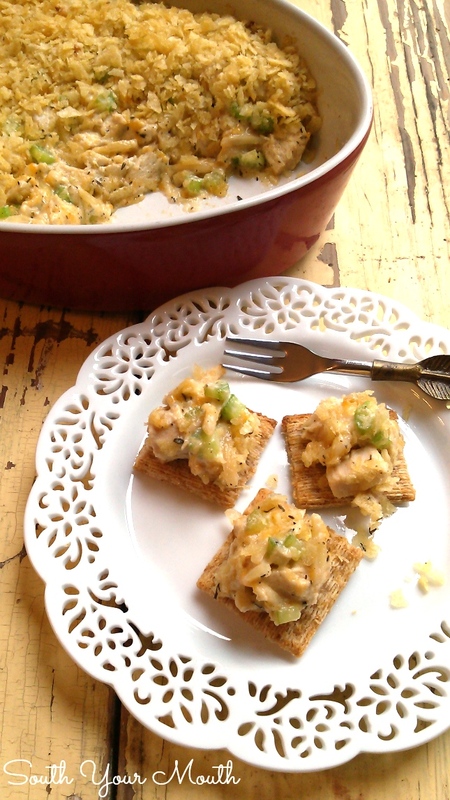 Hot Chicken Salad is a retro appetizer recipe made with almonds, cheese and celery topped with crushed potato chips served hot with crackers or served as a casserole. Have you noticed what a comeback retro recipes are making these days? Especially appetizer recipes. I think food bloggers have a lot to do with it, actually. 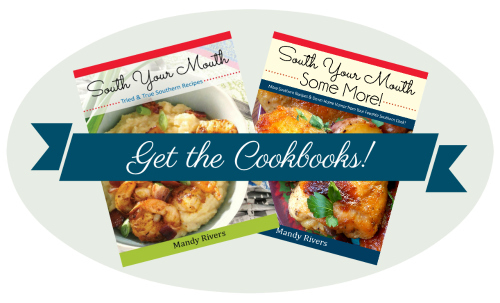 We all dig into our family recipes, many of which our mamas made. And at my age, that puts a big chunk of my mother’s recipe collection slap-dab in the 70’s. I was thinking about this last week and started flipping through my mental recipe box of other forgotten favorites and remembered this one! I don’t know if this is a Southern thing or if everyone made it but it was huge in the 60’s and 70’s around here. It was a hit at potlucks, bridal showers, church dinners and cocktail parties. I’d love to get feedback from y’all on that. If you’re familiar with this dish, comment below and let me know where you’re from! I made this today and took it over to Mama and Daddy’s to snack on before we had Sunday dinner. I figured they would remember this but both of them just blinked at me when I told them what it was. They’d either never had it or just didn't remember it. I spooned some on some crackers and set a plate out for them to sample. And my daddy really took a liking to it. I can always tell when Daddy really likes something because he’ll keep popping his head back in the kitchen to get more. Like he did with the Goat Cheese with Honey, Dried Fruit & Nuts until he finally told me to put it somewhere he couldn't find it before he hurt himself. He’s a hard sell. It’s got to be something really special for him to keep coming back for more so when he made his third trip back to the kitchen I knew I had a good recipe! I've seen it called Hot Chicken Salad Casserole too. And honestly, I bet if you added some pasta to it, it would make a great casserole! 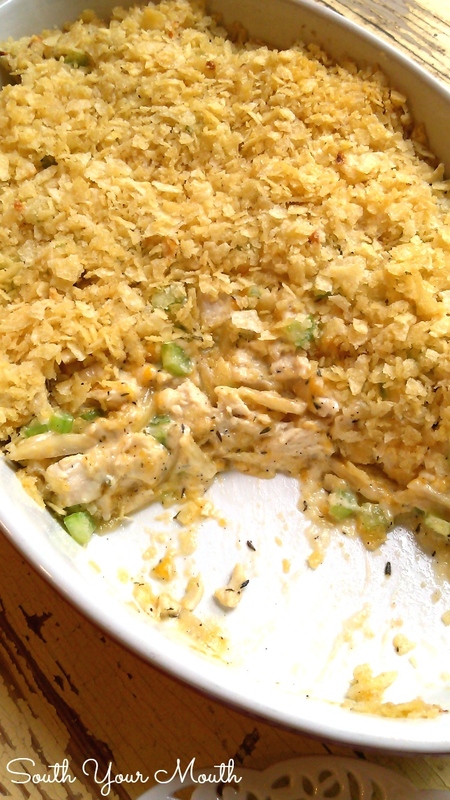 I knew this had chicken, celery, cheese and slivered almonds in it and had mostly seen it topped with crushed potato chips so that’s how I made mine (though I think I've seen it with crushed cornflakes and crushed crackers too). The rest I just kept messing around with until I thought it tasted good. And according to Daddy, I must have hit the nail on the head because he, for one, sure did enjoy it! Add chicken, celery, almonds and cheese to a large bowl and stir to combine; set aside. Combine mayo, sour cream, thyme, salt, pepper, garlic powder and onion powder in a small bowl and mix well. If you’d like yours to be extra creamy add a heaping tablespoon more mayo and sour cream. Add mayo mixture to chicken mixture and stir until thoroughly combined. Lightly spray a shallow 2-quart baking dish with cooking spray then spoon chicken mixture evenly into dish. Top with crushed potato chips and bake at 350 degrees for 25-30 minutes or until bubbly. 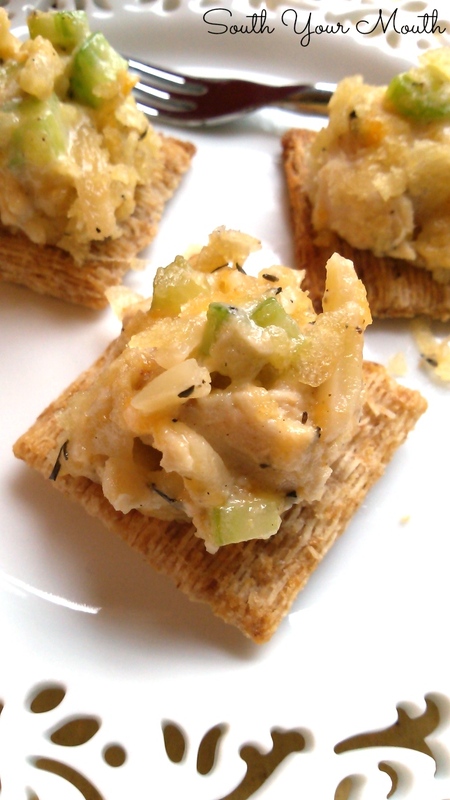 Serve warm with crackers, rye toast points or pita crisps. I used Triscuits in this photo but they're really not my favorite with this. My favorite is simple butter crackers like Ritz or Toll House. When I need cooked chicken for recipes like this I always cook the chicken like this: Place the breasts in a medium saucepan, add just enough water to cover the chicken and 1 teaspoon salt. Heat on medium heat until simmering then reduce heat to medium-low and simmer, uncovered for 20 minutes or until chicken is cooked through. Remove chicken from water and let rest at least 20 minutes before cutting. I used half cheddar and half swiss in this batch because that’s what I had on-hand (and thought it was great!) but just use whatever you have or prefer. I love this. We (in Louisiana) still have it for showers and parties! I'm from Lafayette, Louisiana and I loved this! Funny how just reading the name of a recipe can instantly put you in another time and place (and make you hungry because you forgot to grab breakfast). I remember having this as a main dish. The plate with the cut-out detail is beautiful! Where did you get that plate? I want an entire set of them, do share where you got them from! And yes, I *love* vintage recipes. They are always crowd pleasers, especially with men. Haha! I wish I had more! Mama bought some at Home Goods and gave me a few. It was a while back so I don't know if they still have any. wouldnt toasted almonds be better? My mom used to make this when I was a kid. She would serve it with a baked potato or rice to make it a meal. I loved it and had forgotten about it. We also used to have this with tuna instead of chicken when Mama was in a mood. Still tasty after all these years. I like to add rice to this for a casserole meal. Great with water chestnuts, and sometimes hard-cooked eggs. I was sitting here moping until I realized that this entire recipe is gluten-free! Yippee! Pinned it! Since "pinning" this - I have been craving it - I don't see any reason why I couldn't keep this warm in a little dipper crock pot..has anyone tried that? I bet this would also be great to make using left over turkey from Thanksgiving! :) YUM! Did you mean 3 whole chicken breasts or ( 3 ) 1/2 chicken breast ? Thanks for this different and lovely salad. Does cooking the chicken all the way through at the beginning of the process make it (the chicken) tough since you are cooking everything else? Should you only partially cook the chicken then add it to the rest to bake? This is the real deal. I had this in the 70's and made a complete pig out of myself. It's in the oven right now. I use almost the same recipe but I have an addition to it. Add a little Tony Chechere Cajun seasoning to the liquid when you cook your chicken. I do my chicken as tenders in the oven and I load them up with Tony's. I noticed that you liked the Cajun soup mix! I also add a little when I mix everything together. Another addition I make is celery seed. It plays great with the chicken. I use almost the same recipe but I add a little Tony Chechere Cajun seasoning when I'm cooking the chicken. I also add a half teaspoon into the spice mixture. It gives it a little kick put people can't quite figure out what it is. Now, my neighbors request it. I also add a little celery seed. Thanks for the recipe. My mom made this! I don't think we had a starch with it but always orange Jello with mandarin oranges on the side! Thank you for posting this; I have been looking for it! I need to make a larger than 2qrt dish; could I just double everything? Any tips/adjustmebts? Thank you! Yep, just double everything! You might need to cook 5-10 minutes longer too. Thank you so much, Mandy. I Made it tonight and it was a hit! Fantastic! I made a loaf of beer bread and served it with this ..'tis a keeper!! We had this a parties served in the little pastry shells, like Pepperidge Farm made. Wonder if those are still around?